The other day, I shared out a Google tool that allows you to have “characters” in a Google Doc “write” with each other. This video is from a related tool, in which you can collaborate with “masters” of literature – Shakespeare, Poe, Dickens, etc. Google captures the real-time writing in the document and kicks out a link. I did a videoshot of my writing with the tool and then layered in some audio reflections of the experience. You can “view” my live document here. I want to thank Rick Riordan. When my youngest son turned eight years old, he suddenly stopped wanting me to read to him. It broke my heart because I have spent years with him and his two older brothers, snuggled up, reading books together. But he now reads his own novels (He’s in the middle of the Harry Potter series). I wandered around the house, without a listener (the dog wouldn’t sit still). But when The Mark of Athena — the most recent book in the Heroes of Olympus series by the prolific Riordan — came out, my son came back in. So, I owe ya one, Rick. (Plus, he has learned how to count with Roman Numerals with the book. I’ve had him tell me the chapter number for each chapter, navigating the Roman symbols in a fun way). My son and I have spent the last two weeks completely immersed in the continuing saga of Percy Jackson and his demigod colleagues, including his girlfriend, Annabeth Chase (daughter of Athena), as they continue to move towards an epic battle against Gaia and the forces of Giants who want to overthrow Olympus and destroy the world. I won’t give the plot away, but this book centers on Annabeth Chase more than any other demigod, and that’s a good thing. She is smart, and powerful, and she uses her wits to survive a terrifying ordeal late in the book. And the seven demigods are mostly an interesting crew. The only one who does nothing for me is Jason, the son of Jupiter (ie, Zeus) who just seems like a dud to me. A powerful dud, but still, a dud. Still, Riordan finishes the book up in a very dramatic style, sending two demigods to an unknown future (I won’t say which two) in a classic cliffhanger moment. I got to the last page and my son looked at me. You could say he’s hooked. Thanks, Rick. If you are just joining me here, you may be wondering about my sudden fascination about zombies. 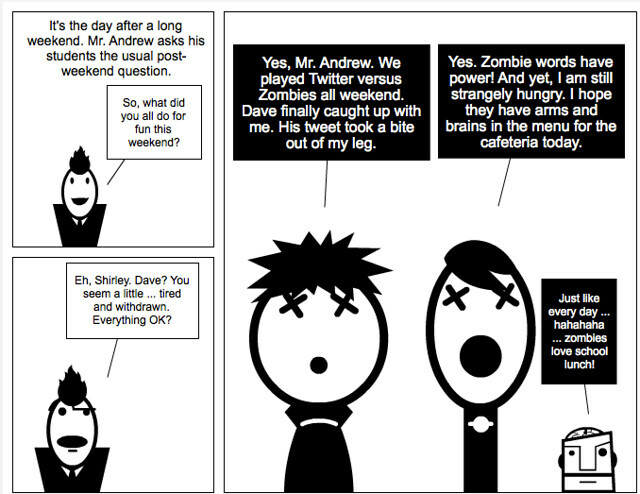 Well, I am taking part in a weekend Twitter-based game called Twitter vs. Zombies as part of Digital Writing Month. (You can see my post about it from yesterday). And I figure, as long a I am in the game, so, too, should the characters from the webcomic I have been creating as part of Digital Writing Month. And so, Shirley is on the run from her friend, Dave, who has been bitten and is hungry. In this game of text and tweets, you can’t trust anyone. Not even your favorite blogger. I can’t say I am a big fan of zombies (well, who is, really?) and I have often wondered about the ways zombies have taken anchor in popular culture. 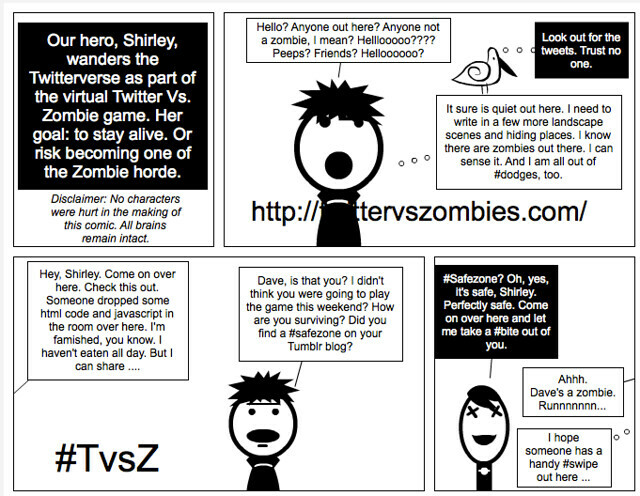 But friends in the Digital Writing Month adventure launched a Twitter-based game called Twitter Vs. Zombies is more complex than I can go into here (although you can find all the emerging rules here). It’s essentially a massive game of Twitter Hashtag Tag, and I have to say, it drew me in this weekend. I started the game out as a zombie (no comments from the peanut gallery, thanks), and throughout the day, I tried to bite (#bite) humans to turn them into zombies, as they used various hashtag commands to escape (#dodge) and save themselves (#swipe) as a cooperative survival experience. What struck me early on is how easy it was to become immersed in a game that was entirely virtual and in text. And it was fun, particularly as folks got more and more creative with their tweets as they ventured into the imaginary landscape. Pretty amusing. I was reminded a bit of Jane McGonigal’s theory around gaming, particularly large-scale social gaming, and how the act of play and invention brings together a myriad of people (even zombies). I wonder how this could translate to the classroom — without zombies, perhaps, but in some other vein, so that the nature of game and play would become an undercurrent throughout the day, week, or month. I think some schools have done this, and I need to do some research. Another thing that struck me was how different this kind of game is from other games that I play — from video games, where we are mostly in the world of someone else’s imagination, to board games. Here, although the rules provided some boundaries (I got called on the carpet for exceeding my #bite ratio and it was my own fault — didn’t read the rules carefully enough), it was the imagination of the folks playing that created the “board” on which we — the “pieces” — were moving. I admire the folks who set Twitters vs. Zombies up, and how they created not only rules set for adaption and potential flexiblity based on users comments and suggestions, but also a spreadsheet for keeping track of data. Very interesting. 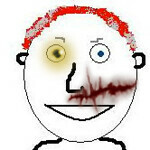 PS — speaking of decomposing, that is also the name of the blog of my friend, Paul Oh. Maybe he’s a zombie, too? This coming week, my wife and I had off to Las Vegas for the annual gathering of the tribes of the National Writing Project and the National Council of Teachers of English. Last year, due to budget cuts, I did not go to the annual event — the first time that I missed it since I became part of the Western Massachusetts Writing Project. And boy, did I miss it. On Thursday, I am joining some amazing NWP colleagues to present a session around Game Design for the classroom. We’re aiming to bring folks into the world of gaming from the standpoint of creation, not just playing. So, along with showing the pedagogy of game design and the connections that it can have to the classroom (along with motivation of students), we’re going to have folks doing some game design activities in the sessions. It should be a blast. On Friday, I am one of a handful of speakers in a session at NCTE around bullying. My topic is cyberbullying, and how schools are working to address online situations and how teachers can frame discussions around the larger issue of digital citizenship. My goal is to avoid the message of “the Internet is bad” and instead, show how young people need guidance on how to behave when in online spaces, both for their own safety and also for the respect of others. And on Saturday, I am giving an Ignite talk along with a bunch of others. Ignite talks are 20 slides that change every 20 seconds, so you have go be light on your feet. While the them of the session is around professional connections and inquiry, my Ignite explores the idea of short-form writing (Twitter, updates, etc.) and how writing can change to meet the forms of the day. And on Sunday, we rest. And fly home. We reconnect with our kids. And get ready to teach the next week with a dose of inspiration from being part of a gathering of educators. 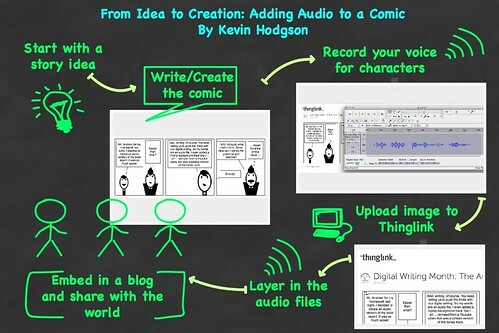 The other day, as I was working with Thinglink on a media piece about digital writing (you can still see what I did and add your own thoughts) for Digital Writing Month, I had this brainstorm of using the site to add an audio track to a comic strip. Actually, the process became a bit more complicated than I first thought. Here’s what I ended up doing, and try to view the process through the lens of digital writing. In this case, I was thinking of the audio engineering as ‘writing’ and how I worked to manipulate, and then embed my voice, was part of the compositional process. I can’t make it all visible here, but it had me thinking and working/reworking the concept I started with. First, I decided that the comic should include an audio storyline, so that the content of the comic would coincide with the ways I was composing the piece. I decided that one of the kids would turn in a report, all as an audio file, and this would cause the teacher to struggle over ideas of traditional grading. Second, I opened up Audacity. I read through the speech bubbles. I began by creating a file, and then creating a second file, for the same character, but ran into problems when I began to change the pitch with some Audacity tools — in order to give the kid a higher voice and the teacher a lower voice. After one round of recording Dave in the first frame, I could not match his voice pitch for the second frame. Ack. I went back to square one, and deleted all of my work, starting over again. This time, I made one master file with all of Dave’s speech, added the pitch change, and then tinkered with cutting/pasting editing of that one master file to create MP3 files that all had the same pitch. I did the same method for the teacher, but here I had a little conundrum: the thought bubble. I knew that the voice should change — the voice in our heads is different from the voice that comes out of our mouth — and decided that adding some echo/reverb might aurally indicate the thinking of a character, as opposed to the talking. I think those words got a bit muddled on me. Later, I thought about how I should have tweaked that a bit more. Oh well. After making all five MP3 files from the various speaking/thinking parts, I uploaded them into my Box storage site and grabbed the direct links. Then, over in Thinglink, where I had already uploaded the comic (which I created over at Stripgenerator and then hosted over at Flickr), I layered in links near each character’s speech, so that clicking on the little circles will bring you to the audio file. Or, if my words were a bit too rambling and unclear, maybe this image will help, showing the path of creation. It’s not perfect. Far from it. For example, I don’t like that a new window opens up, but I don’t see any solutions to that problem. But in the end, it was a fun exercise in the possibilities of mixing media and compositional practices using digital tools. We did an activity the other day, writing 25 word stories with inspiration from one of the fascinating drawings from the Mysteries of Harris Burdick collection. 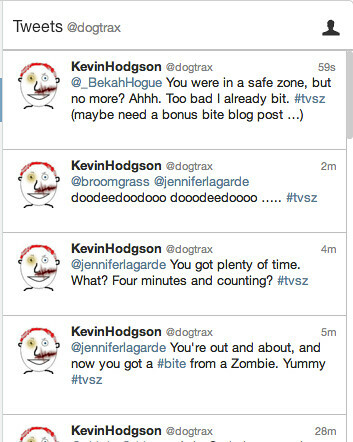 Here are some, posted on a Glog.